Based in Turin, Italy, our cutting-edge R&D department is dedicated to developing our innovative, efficient and user- friendly Inkmaker software. Available in over 30 languages, our software can operate anything from small compact units to complex industrial systems. 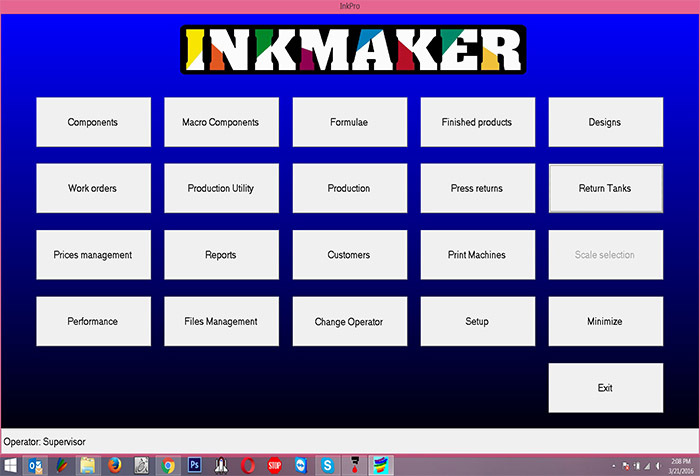 Inkmaker Software is the brain behind the reliability and consistency of our technology. Easily expandable and customized, it offers unlimited application fields and can be integrated with all leading management applications. As your business evolves, you rely increasingly on tools that provide connectivity to corporate resources and the Internet, as well as to your colleagues and business partners. That means you need tools that are familiar and easy-to-use, which is why our proprietary Inkmaker software has been carefully designed to evolve with your business. Our software specialists thrive on challenge, and can create software from scratch to fulfill your special needs.